An excerpt from Kalidasa's Vikramorvasheeyam. 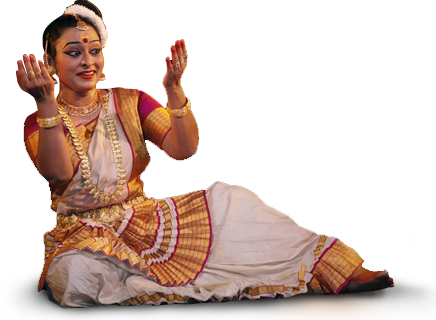 The performance begins with the portrayal of Urvashi and her friends merry making and dancing. The demon Keshi abducts Urvashi and her friend Chitralekha. The other damsels cry out for help. King Pururavas hears this call for help while travelling by chariot. King Pururavas rescues Urvashi and her friend from the Demon. After gettting back to her senses Urvashi asks- "friend, tell me who rescued us? Was it Indra?" Her friend replies- "It was not Indra but a human king who is equally powerful as Indra." The moment Urvashi sets her eyes on King Pururavas, she falls in love with the magestic form standing in front of her and the King too can't take his eyes off the maiden Urvashi. Pururavas is so impressed with the beauty of Urvashi that he wonders who created this maiden. He is sure it cannot be Lord Brahma as he is so free of emotions that Brahma cannot create such beauty. He wonders if it is the Moon or the lord of love- the Madana or the season Spring who created this maiden. Their love increases as they travel by the chariot. While, so charmed with the King, Urvashi is reminded about her celestial duties such as performing in the Indra's court, by her friend Chitralekha. And she with her friends leaves to Heaven. 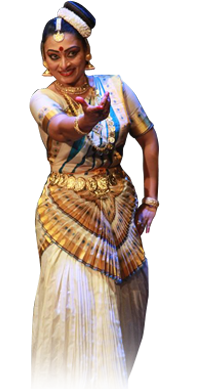 During a performance in the heaven, by slip of tongue, Urvashi pronounces "Pururavas" instead of "Purushottama" and an enraged Bharata curses her to lead a mortal life on earth with Pururavas. The performance continues to show Urvashi coming to earth after losing her place as the damsel. Years passed happily with each other. Then again, one day while king Pururavas and Urvashi together sporting in the Gandhamadana mountain, King Pururavas sees another Damsel and takes his time to enjoy her beauty. This annoys Urvashi. She refuses to listen to any explanations offered and walks away into the Kumaravana, which is forbidden for women. Urvashi enters the Kumaravana and turns into a creeper.